ROSSBURG, Ohio (April 21, 2012) – The concrete wall ringing the dirt around the topside of Tony Stewart’s historic Eldora Speedway has intimidated just about every driver who has ever turned laps at the nationally acclaimed half-mile clay oval. Two drivers who have plenty of respect for those walls are World of Outlaws Sprint Car Series champions Steve Kinser and Donny Schatz, and they are the two most recent additions to the driver lineup for the June 6 Prelude to the Dream. Twenty-time Outlaws champion Steve Kinser and his Tony Stewart Racing (TSR) teammate, four-time Outlaws champion Donny Schatz, are each well-versed in the fast way around Eldora. Both will trade their Sprint cars for dirt Late Models as they make their first-ever dirt Late Model start in the all-star race featuring more than 25 world-renowned drivers from all walks of motorsports. Kinser has won a staggering 570 World of Outlaws A-Feature races during his illustrious career with 35 coming at Eldora. The Bloomington, Ind., native also has an International Race of Champions victory at Talladega (Ala.) Superspeedway in 1994 on his resume, as well as starts in the 1995 Daytona 500 and 1997 Indianapolis 500. Kinser, known in Sprint car racing circles as “The King of the Outlaws,” began racing after a successful high school wrestling career that included an Indiana state championship during his senior year at Bloomington High School in 1976. He followed his father Bob into racing and, once he hooked up with his cousin Karl Kinser in 1978, he began building his legendary status in short-track racing. Kinser won his first-ever World of Outlaws feature at Eldora in May 1978 and picked up his first Outlaws crown later that season at Eldora. Kinser has won more than 60 races at the facility, including victories in USAC Sprint Cars, USAC Silver Crown, All-Star Circuit of Champions and several unsanctioned Sprint car events, including the 1984, 1988 and 1991 Kings Royal, and 1997 and 2000 $100,000-to-win Historical Big Ones. The conclusion of the 2010 Kings Royal – Kinser’s most recent Eldora victory – was vintage Kinser. He scraped the wall several times as he desperately tried to take the lead in the 40-lap contest and appropriately used a late-race restart that provided him one last opportunity to execute a perfect slide job to claim his seventh Kings Royal win. Kinser hasn’t always come out on top when he’s battled at Eldora. He’s had his fair share of accidents trying to squeeze as much speed as possible out of the track. Schatz, his TSR teammate, also has had his share of unscheduled meetings with Eldora’s unforgiving wall, but after a few hard knocks and plenty of laps, the Fargo, N.D., native has become one of the best at circling the high-banked track. Schatz first came to Eldora in the spring of 1996 as a 17-year-old ready to learn from the best. He pitted next to Kinser but, before the cars could hit the track, a North Dakota-like snowstorm hit the western Ohio facility and postponed his debut. He returned a few months later for the Kings Royal and splashed onto the scene by finishing eighth in the nationally televised event. 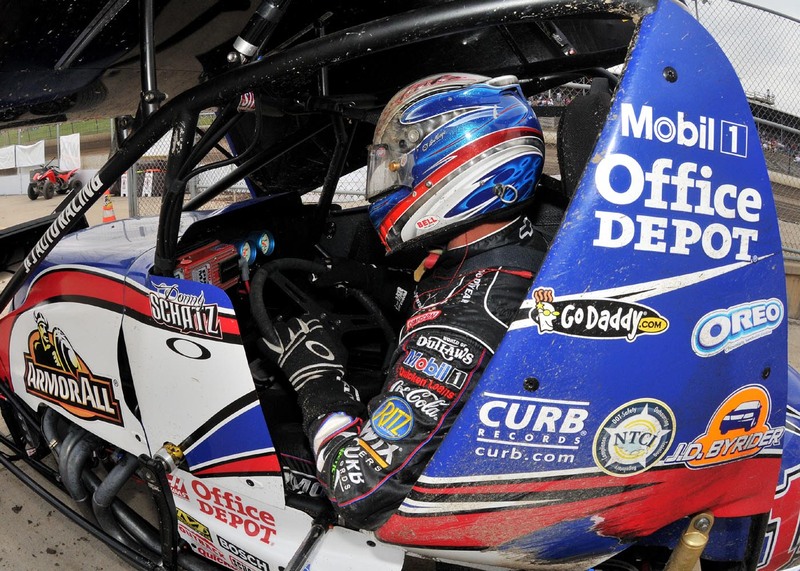 It was six seasons later when Schatz finally earned his first victory at Eldora. The win came in dominating fashion as he rode the high line to a $100,000 victory in the 2002 Historical Big One. As his career progressed, he became known for winning the highest-paying races and, in 2007, Schatz earned his first World of Outlaws A-Feature triumph by scoring the $50,000-to-win Kings Royal, winning by nearly nine seconds. His most recent victory at the track came in July 2009 when he scored his second Kings Royal triumph. Kinser and Schatz will be the third and fourth World of Outlaws champions to compete in the event, joining Dave Blaney and Danny Lasoski, who won the 2001 Outlaws title and finished third in the inaugural Prelude in 2005. Blaney, the 1995 Outlaws champion, will be making his sixth Prelude start this year. His best finish came in 2006 when he raced to a second-place finish. The 2006 event was also the year TSR teammates Levi Jones and Josh Wise took part. Race fans can catch all the behind-the-scenes preparation for the Prelude by following the track, event, charity, drivers and officials on Twitter: @EldoraSpeedway, @PreludetoDream, @FeedTheChildren, @TonyStewart_rcg, @KyleBusch, @KenSchrader, @RickyCarmichael, @AustinDillon3, @JasonLeffler, @JJYeley1, @DanicaPatrick, @RyanNewman39, @Bobby_Labonte, @Kenny_Wallace, @tydillon, @aric_almirola, @JimmieJohnson, @J_Allgaier, @skiprec, @DavidGilliland, @ClintBowyer, @KaseyKahne, @KurtBusch, @TonyKanaan, @NAPARonCapps, @BuckeyeBullet10 and @RogerSlack. Kinser and Schatz join the previously announced Feed The Children Prelude to the Dream drivers Tony Stewart, Kyle Busch, Kenny Schrader, Ricky Carmichael, Austin Dillon, Jason Leffler, J.J. Yeley, Danica Patrick, Ryan Newman, Bobby Labonte, Kenny Wallace, Ty Dillon, Aric Almirola, Clint Bowyer, Kasey Kahne, Kurt Busch, Dave Blaney, Tony Kanaan, Ron Capps, Jimmie Johnson, Justin Allgaier, Bill Elliott, Ray Evernham, David Gilliland and Cruz Pedregon. Tickets and campsites for the Feed The Children Prelude to the Dream and all other 2012 Eldora Speedway major events, including the $100,000-to-win Dirt Late Model Dream presented by Ferris Commercial Mowers, the $50,000-to-win World of Outlaws Kings Royal and the 42nd annual World 100, are available through the speedway box office by calling (937) 338-3815 or online 24 hours a day at www.EldoraSpeedway.com. The track’s Facebook page is at www.Facebook.com/EldoraSpeedway.